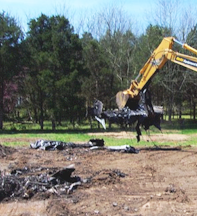 Chase Environmental Group was contracted to provide contaminated soil and debris removal at the site of a Navy F/A 18 jet Crash at a remote site in Dayton, TN. Chase established a grid system in the remediation area. The remediation area consisted of three “zones”. Zone One was approximately 75’ x 250’ and was considered to contained soil which had the highest probability of containing impacted soil Zone Two was a fifty-foot wide border around Zone One. Zone Three was a 100’ x 200’ area north of Zone One, which contained soil that had a low probability of being impacted. Samples were obtained in opposite quadrants of the all grids using a flame ionization detector. Grids which contained field screening results above 50 ppm were excavated using tracked excavating equipment. Chase placed the material into a stockpile. After obtaining approval from the state, the waste soil was loaded in dump trucks and taken for disposal. The plane debris was loaded into roll-off containers for disposal. Debris removal was completed in Level C personal protective equipment due to the hazards associated with removal of carbon fibers contained in the plane pieces. After each grid was excavated, additional field screening samples were obtained to verify that the remaining soil was beneath clean-up levels. When field screening was completed, Chase personnel obtained confirmatory samples and sent samples for volatile and petroleum hydrocarbon analyses. After the confirmatory results demonstrated that the levels in the soil were beneath the clean-up level, the area was backfilled with soil, topsoil and seeded and mulched. The plane crash impacted a small stream that bisected Zone One. Chase personnel excavated the stream bank and placed rip-rap in the areas of remediation. 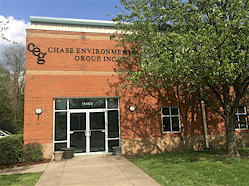 Chase personnel also completed improvements to the property’s access roads and improvements to surface drainage pathways. Approximately 1000 tons of non-hazardous hydrocarbon impacted soil and plane debris were disposed. Chemical: Hydrocarbons; Special Waste, Recyclable petroleum products.